The Art of Furry Fandom got my attention through a thumbnail on the front page of Fur Affinity. I had no idea that Mark was the poster, but it seemed newsworthy, so I emailed the gallery. The next day, I got an enthusiastic call from Rod, and an invite to call Mark. I looked them up and realized they weren't young'uns, but long time core names. (I'm slow, huh?) Searching Mark's name led back to a comment I left on Fred Patten's "Illustrated Chronology of Furry Fandom, 1966–1996", about the energy of live events. Looking at this list, many things look like they cross over pop culture and fan culture in a more potent way than today, when things are published to the internet and its' static noise... I could be wrong about those qualities of "furry fan media", but these days I feel like live events is where the most energy is... I think the quality of fursuits and amount of suiters you can see in one place is evidence of that. Mark's journal talks about the shrinking of art shows at cons. But a Furry show at a public gallery seems like a special live event, however modest the size (eleven pieces of art). As I've said about street fursuiting, I dig the spontaneity of interacting with people who haven't been exposed to Furry magic yet. Here's a photo set of what they will see this month. I asked Rod: what's the experience been like? Now my mate (Sylys Sable) and I have been interested for literally decades in getting furry art out in front of the more general public, or at least out in front of an artsy crowd that was not the usual furry convention-going group. Both of us have been in the fandom long enough to see how the general public has come to think of furry fandom as being mostly "about" fur-suiting -- when we know from our own experience just how much more important a factor the art is to many of us. But so few people have a chance to SEE the art unless they go to a furry convention or go searching around furry art sites on The Net. So, I began gently talking up some of the gallery owners about the possibility of a curated show dedicated to anthropomorphic art. After a few trips, I also started bringing along a paper portfolio with print-outs of various art I had seen on Fur Affinity -- specifically, that art which I thought would be especially impressive to an "art gallery crowd" because of the technique involved. At the Avant Garden I met Ellen Seefeldt and struck up that same conversation. After showing her and a few of her associates the art samples, she mentioned that a furry fandom collection might fit very well as a "back wall" display for her own photography exhibition which would be premiering in June. With that in mind I got to work asking, cajoling, and downright begging various artists around the fur fandom to contribute art for the show and sale. We had 16 feet of wall to fill up! Eventually after nearly a month of constant song-and-dance, five artists had volunteered material: Steven Martin, Sherwood, Brown Wolf, and the photographer known as Changa Lion. All of them have pages on Fur Affinity under those names -- and, as it turns out, all of them happen to live in Southern California. On the morning of Sunday the 26th Sy Sable, Changa Lion, and myself trudged the art submitted down to the Avant Garden for set-up day. Ellen seemed very impressed that we had brought our own hanging supplies and even made our own labels for the art -- We had to gently explain to her that we have been working furry and science fiction convention art shows for decades now, and we've learned a few things! 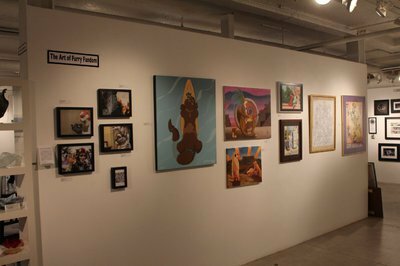 The Art of Furry Fandom officially opened with the gallery that afternoon, and will be open for business on Fridays, Saturdays, and Sundays until June 29th. The official opening reception is being held during the Art Walk for June, which takes place June 2nd, concurrently with CaliFur in Irvine. Thanks to Rod, Mark, and the artists, a few new fans may discover their inner Furry this month in Santa Ana. Hmm. I'm headed out there on Friday for Califur; not sure I would want to go five miles to drop by, though! Perhaps it will encourage a few people to drop by Califur to see what all the fuss is about. I did see the Slave Labor Graphics exhibition – I'm a fan of one of the artists – but alas, saw no other furs (or anyone) there. Of course, there was a far more comprehensive art gallery inside FC, but you had to pay to see that one. OH, NOES! Five miles out of your way? I'm flying there, and I won't have a car, and it's five miles uphill each way along a busy street! It is actually out of the way, yes, and probably 20 minutes to get to and back from even with transportation. I guess you could do it if there was an hour free on the schedule and you just wanted to drop in and see the art - or you were getting lunch on the way. 5 city miles is longer then 5 country miles. With or without a car. Well, uh, good points and well made. Perhaps we could prevail upon Mark or Rod to put up a photo set of the eleven pieces on Flayrah after it is over (with the artists' permission), so it is available for all of Furry fandom to see, and to document just what 'The Art of Furry Fandom' consisted of for the fanhistorical record. The one included in the article gives a reasonable idea, although sometimes at an awkward angle - a range of semi-morphic to fully anthropomorphic art (including MLP), and some fursuit photography. One day, maybe we'll have our own museum! I am sure some furs will . . . uh, pony up. My own collection of Furry art -- paintings by Steve Gallacci, Terrie Smith, Fara Shimbo, Chuck Melville, Vicky Wyman, Steve Martin, Jerry Collins, Ken Fletcher, Dave Garcia, Bryce Nakagawa, Susan Van Camp, Deal Whitley, Michele Light, Ken Pick, Pat Kelly, and other Furry artists from the 1980s to when I had my stroke in 2005 -- has been promised to the University of California at Riverside Library when I die. A Furry museum is a wonderful dream, but I would want a practical guarantee in its permanence before I trusted it as a home for my paintings. It seems that even the fantasy/SF art community still lacks a museum capable of acting as an important hub for the genre, but personally I'm convinced that furry art is more suited than those genres for venues such as galleries and museums. IMHO as of today the furry art community has more similarities with the fine art community than it does with the world of illustration or comic arts... but only time will tell I guess. Sounds like you have gathered a fantastic collection by the way, and it prompts me to ask a question: do you happen to own the Steve Gallacci painting which was the initial spark of the furry fandom back in 1980 or know who the owner is? I'm holding a panel about the history of the furry fandom this summer at a convention and I was looking for more information about that painting but all I could gather is that it featured Erma Felna in the future Albedo setting, and not even Steve could give me much more information. It seems no scans or photos of that painting have ever been posted on internet either. No, I don't own it, and I don't know who does. I remember being outbid for it at the 1980 Worldcon Art Show auction, and until last weekend I had thought that Nicolai Shapero had gotten it. But I was told at CaliFur IX last weekend that it wasn't him. Do the 1980 Worldcon Art Show records still exist? You have the description right. That's unfortunate. :-P Thank you anyway. If I ever find out something more about the picture I'll let you know. If it makes furries feel any better (and SF/fantasy fans as well), AMPAS, the group that does the Oscars, only got a film museum up this year.